The big homie Tricksta has a new weekly hour DJ Mix/radio show ‘The Tricksta Show’ starting every Wednesday from 21st September 2016. To give you a taste of what to expect he’s dropped this dope Warm Up mix giving you some of the best Hip Hop from both sides of the Atlantic. Check out the Warm up mix here and be sure to check for the show from the 21st! Check the visual for ‘Train of Thought’ from Coventry, UK rapper Shakezpeare linking up with Detroit rapper/producer and Wu Tang affiliate Bronze Nazareth, the track also features cuts from DJ TMB. The track is lifted from the upcoming ‘New Golden Era (NGE)’ EP by Shakezpeare & Bronze Nazareth that will be released by NGE Records on all online records stores from Sept 1st 2016! DJ Shadow has unveiled the music video for the song “Nobody Speak” featuring Run The Jewels, a standout track from his latest album ‘The Mountain Will Fall,’ out now on Mass Appeal Records. The video depicts a meeting of leaders that quickly descends into chaos, a scene not unlike what is unfolding in governments around the globe. It also features appearances by DJ Shadow and Run The Jewels. The video was directed by Sam Pilling and produced by Pulse Films, stars Igor Tsyshkevych and Ian Bailey, and was shot in NYC, London and Ukraine. DOPE!!! Emerging from the late 90’s, early 00’s battle scene, Woody, Tigerstyle and Dopey went up against each other countless times, collectively they took 7 major World titles at arguably the fiercest, most creative period in DJ battle history. 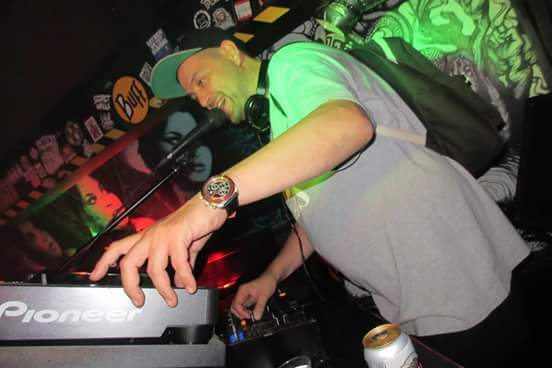 Taken from DJ Woody’s debut album ‘The Point Of Contact’, the track ‘Get Down’ channels that battle mentality with a spirit of camaraderie as these battle veterans prove that their cuts are still as sharp as ever. Check the Official music video for the first single ‘My Addiction’ from the forthcoming Novar FLIP album ‘Damaged’. I’m not usually a fan of trap sounding music, but when the music has content like this track then I’m more open to it. Salute to Novar for his honesty and showing a side many rappers would shy away from. Song produced, mixed and mastered by Donny Bravo. 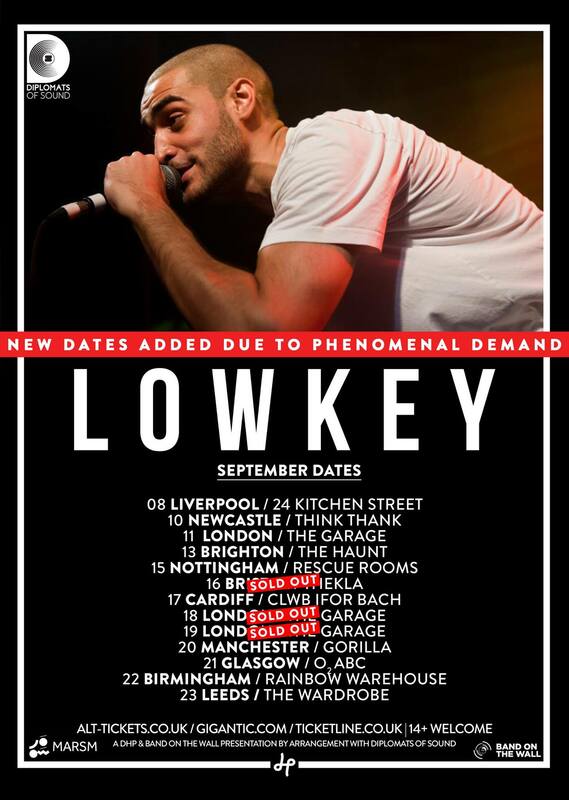 We original shared this video to our FB and Twitter page when this powerful song ‘Ahmed’ from Lowkey featuring Mai Khalil and produced by Agent of Change was released at the end of July, but its only right we rep it on the site too! Lowkey’s music and social commentary has been missed, however with this new music and visual from GlobalFaction here is his first release in a few years and it’s as thought provoking as ever. The long awaited debut album ‘Hastility (H1)’ from the UK/US duo consisting of producer Configa and Queens, NYC emcee HaStyle drops tomorrow (Mon 29th August) and boy it’s been worth the wait! A year later we now have the full length debut album from this talented duo. After previously whetting our appetites with the fore mentioned EP’s, Configa and HaStyle come with deeper content and a darker, heavier vibe with this banger of an LP with features from El Da Sensei, Prince Po, Chino XL, Rashan and dope cuts from UK turntablist DJ Madhandz. We are living in times of great social injustice, racism is still prevalent, Police act with impunity, the use of propaganda and media manipulation is rife, more and more areas of our world are engulfed in conflict and war and people like you and I are fed up, disillusioned and angry with our governments not just in the States or here in the UK it’s a global issue. 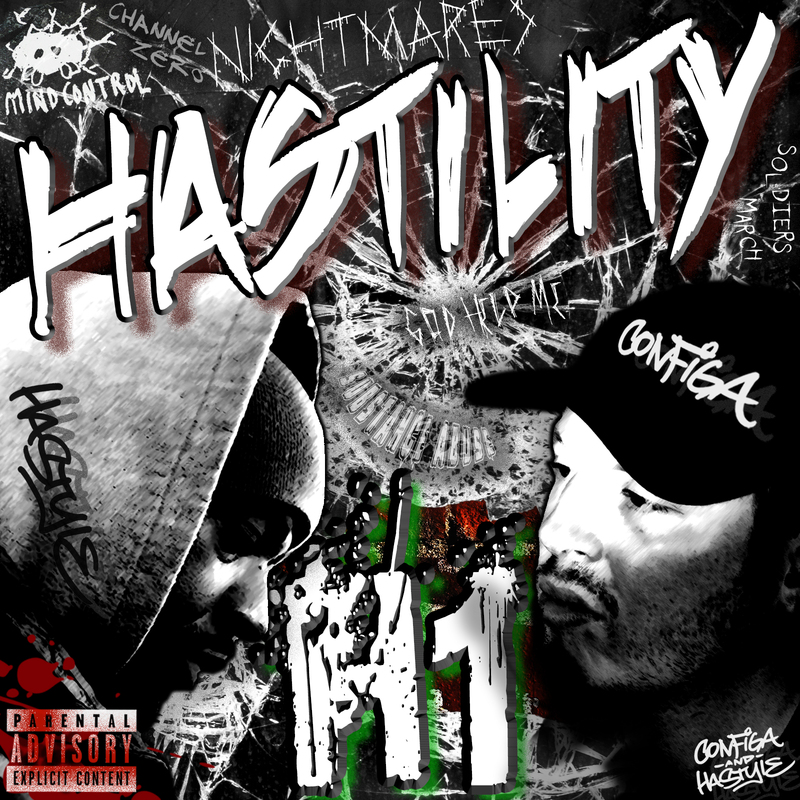 ‘Hastility (H1)’ hits on and encompasses those thoughts and feelings as HaStyle draws on that anger and address the issues waxing lyrical with an effortless flow over the musical canvas Configa provides with his characteristic neck snapping beats that come with a grittier, moody edge to them. There really isn’t a weak joint on this album all the guest features deliver to the standards you’d expect, but Configa and HaStyle are not over shadowed in the slightest and obviously the talent and creativity from the pair of them is what makes this such a DOPE album. Here’s a few joints that caught my attention. The record starts with the Dr Configa Intro (Configa really is a Doctor on Hip Hop ya know, man has a PhD!) this concept sets the scene for the direction in which ‘Hastility (H1)’ is going to take us. ‘Mind Control’ sees HaStyle address how history can and HAS been manipulated and encourages the listener to seek knowledge for yourself whilst at the same time warning our governments can control, watch and invade citizens privacy at any given moment and features a dope verse from El Da Sensei. With heavy boom bap drums from Configa ‘Channel Zero’ examines peoples dependency on TV and its ability to brainwash the masses with constant 24 hour news ramming negativity and fear in to our living rooms. The track ‘Substance Abuse’ speaks for itself there aren’t too many towns and cities across the globe that aren’t touched by the scourge of substance abuse, whether it be alcohol or drugs. I myself still have my own demons that I fight and have lost friends to both drink and drugs. HaStyle doesn’t come across all preachy however, just offering pearls of wisdom to those that may be in that spiral or advising family and friends to look for the signs, this track resonated with me. ‘This World’ featuring Rashan is a more laid back vibe with HaStyle exploring finding your way in life, trying to stay on the right path whilst acknowledging the traps, pitfalls, stereotypes and prejudices that we can encounter on our journeys through this often unpredictable life. As I previously mentioned there really isn’t a weak joint, if I haven’t mentioned a track it’s not that I didn’t like it, I just didn’t want to bore you with my ramblings! ‘Hastility (H1)’ flows seamlessly with cleverly worked samples and cuts that compliment the music without over powering. There is also a clear chemistry between both Configa and HaStyle which shines throughout the album. A lot of time and effort of travelling between the UK and New York has gone on to create this great piece of music and I think it’s that personal interaction between the producer and emcee which makes this stand out above a lot of submissions we get. I have said in the past it’s almost criminal the amount of UK rappers that sleep on Configa’s production, but its their loss, and where many rappers can rap, many can’t story tell like HaStyle so it’s a win win for the pair of them and also for us as fans of Hip Hop. It’s far too easy these days to buy a selection of beats of a handful of producers and throw a project together, but the real craft and art is building something together from the bottom up and that is what Configa and HaStyle have accomplished with ‘Hastility (H1)’, a record that oozes the Golden Era Sound, whilst commenting on the issues that face us today.